The crank was first patented in 1914, and introduced to outfits at the beginning of that year (before the patent was accepted). 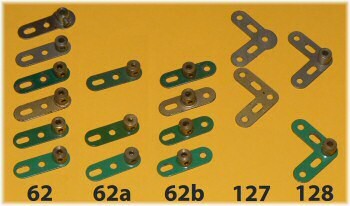 The picture to the right shows the five different types of crank, from left to right: crank; threaded crank; double-arm crank; simple bell crank; and boss bell crank. Immediately post-war, the names of the last two were change to "Bell crank" and "Bell crank, with boss" respectively. However, the bell crank (part 127) was only supplied as a spare part for a short time in the late 40's / early 50's before being dropped. The double-arm crank in particular is now a sought-after part. 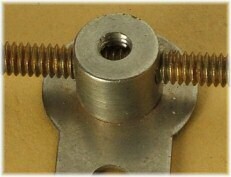 It is often used to reinforce a bearing, as it has bolt holes either side of the central boss. The simple bell crank is fairly rare, as it was dropped from outfits in 1930 and only supplied as a spare part. The iconic supermodel 4 (Giant Block Setting Crane) calls for four of these parts to make up the Fidler's gear, which is probably the main reason that any were sold or are still called for. There are three main variations in the cranks, apart from their finish. Initially, the cranks had a large circular area surrounding the boss, which was removed in around 1925. However, the simple bell crank is found in dark green with the circular surround, and is shown like this in the 1928 printing of SML4. As it was not supplied in any outfits or accessory sets it is not surprising that there were stocks of the older shape much later for this part. 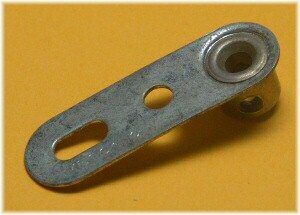 The threaded crank, by contrast, was supplied in 6 and 7 outfits and so probably changed earlier, along with the standard crank. Around 1930, the cranks were changed to have a recessed area where the boss was fitted. This recess allowed the crank to be bolted flat to another part – something that hadn't been possible for years. 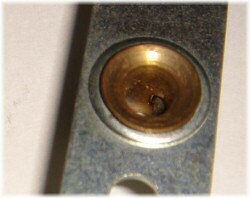 Note that the very earliest type of boss (as shown in the nickel picture above) is almost flush with the surface, but this is not the case with later ones. All bosses after around 1930 are of the recessed type, in all finishes. The author has an early 1930 export outfit 7 (manufactured late 1929), which has a mixture of cranks of both types. Finally, during the gold period (1934-1941), the length of the first three cranks was reduced from around 1 19/32'' (40.4mm) overall to exactly 1½'' (38.1mm), as shown in the picture to the right. The positions and sizes of the holes remained exactly the same, relative to the boss. This change solved some issues of cranks interfering with nearby parts and allowed them to be used in tighter spaces. All post-war cranks have the shorter form. No, actually, not quite all of them. The 1980's French production of cranks became available in the UK, and these have the elongated arm on them again, as per this photo of a late 80's example sent to us by William Irwin. Do all French cranks have this elongated arm? Since the change to shorter arms happened during the gold period, which was when the French manufacture started deviating from UK production, were they kept longer the whole time? Examples of the larger French post-war outfits on ebay would seem to show that they were. 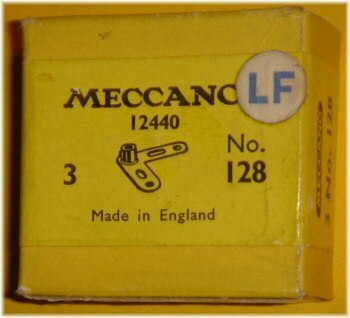 Although the bell crank without boss is often assumed to have been dropped after the war, it was in fact manufactured in small quantities as a spare part, and examples with the post-war Meccano Made in England stamping can be found. Early double-tapped threaded crank, is this a first? John Nuttall mentions that the threaded crank is only found double-tapped in the earlier style, as per the picture shown to the left and of 62a.ni1 below. If this is true, it would have been one of the very first parts to be double-tapped. Most parts took this on around 1927/28, so to find double-tapping in 1919 is very unusual. The threaded boss (part 64) dates from the same year, and was also double-tapped from the beginning, although technically it's not really a boss in the same way. This article on the right from the September / October 1919 issue of the Meccano Magazine appears to prove that John is right (of course!). 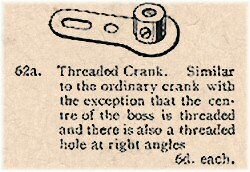 The crank is described: "...the centre of the boss is threaded and there is also a threaded hole at right angles." This looks like a description of a double-tapped 'boss', even though the boss is a non-standard one. Non-brass boss on a crank, possibly French? Martin Hanson has pointed out examples of 1960's-ish era zinc plated cranks where the boss has been plated as well. We'll get photos of those, no doubt, but we haven't been able to date them yet. Another unusual one is the zinc plated version shown to the right, which has a zinc alloy boss (scratching it doesn't reveal brass). The stamping looks to me more like a 1980's French part – does anyone know more about these? William Irwin sent us this picture of a rare mistake during crank manufacture, where the boss has been attached to the wrong side of the blank on a zinc part 62b. The peening is supposed to be on the other side, in the recess formed on the strip. The photo shows 1950's boxes of three threaded cranks, part number 62a. The yellow label signifies medium green parts, and the light green label signifies light green (1958-on) parts. To the right, a 1950s spare parts box containing three of part 128 (bell crank with boss). Since the label is yellow and there's a part number on it, we can be sure that this dates from between 1954 and 1957. However, it also has a small "LF" sticker on it, indicating the use of lead-free paint. All toys had to use lead-free paint during this period, although we don't yet know the exact year this came into force. This labelled box shows that the need for lead-free paint wasn't the only reason for the change to light red/green, as some believe. Here's another real oddity. A spare parts box of part 62a threaded cranks, in what is obviously an old electrical outfit small parts box from the late 20's or early 30's, with a label stuck over the top. The cranks in this box are dark green, of type .dg1 in the table below, which dates them probably around 1930 give or take a year or two. 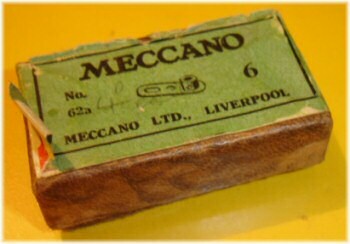 The Electrical outfit was quietly dropped in 1927, so this is obviously an example of Meccano using up left-over boxes. Notes: ¹ Threaded cranks are always double-tapped – the 63a.ni2 variety shown is the double-tapped but otherwise matches the crank in that the enlarged area around the boss has been removed. This means that the .ni3 variation (double-tapped nickel, normally a special-order only part) is not distinguishable from it. I have 5 double-armed cranks which don’t fit into any of the above-mentioned categories. I’d assume they were hand-made replicas, except for the "MECCANO – MADE IN ENGLAND” stamped on them; they look somewhat rough and hand-made. They’re solid brass (a magnet has no effect on them), have double-tapped bosses, are about twice as thick as the normal Meccano cranks, are quite a bit shorter than the normal ones, and lack the usual elongated hole at one end. The corners are not completely rounded off, so they look slightly oblong in shape. There is no recessing around the boss, so they don’t sit flush when bolted to something. I’d love to know their provenance. Well spotted! I think you’re right. I never even thought of it. They look like they have been cut out from bush wheels.